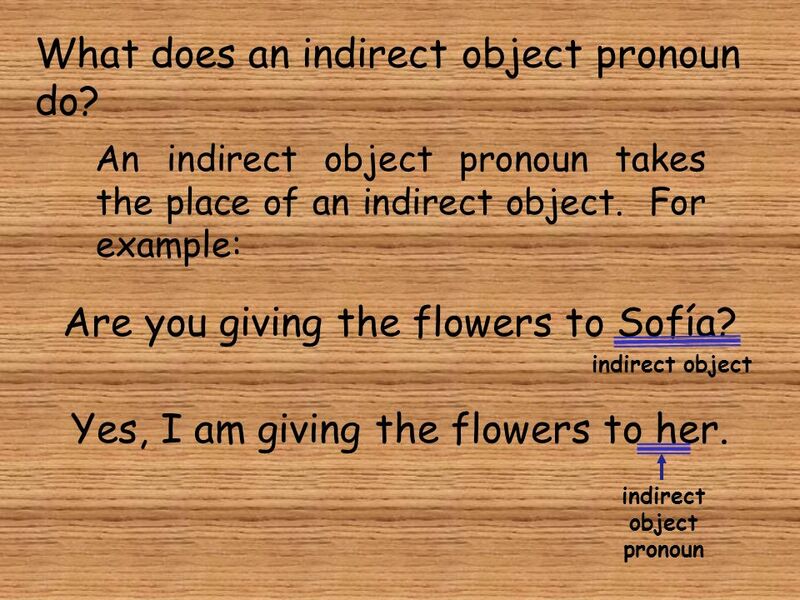 1 CONTENT OBJECTIVE I will be able to replace INDIRECT OBJECT NOUNS with INDIRECT OBJECT PRONOUNS. 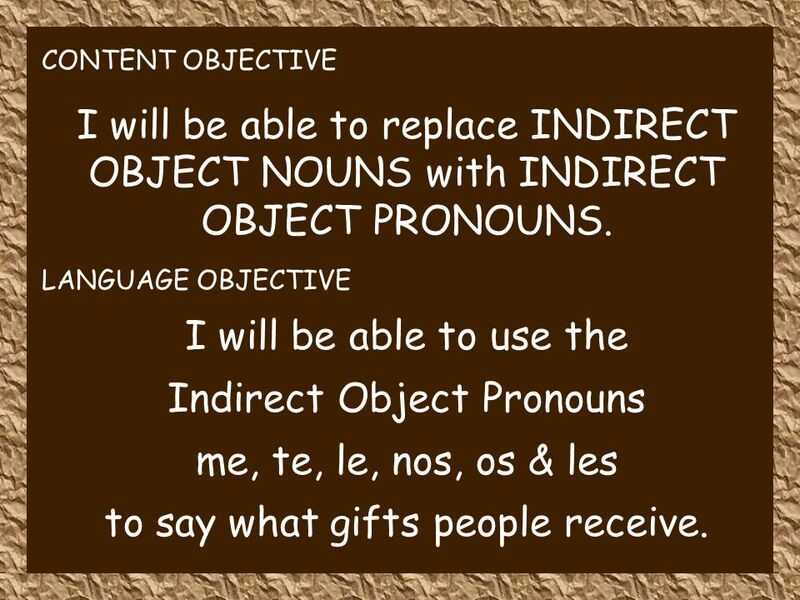 LANGUAGE OBJECTIVE I will be able to use the Indirect Object Pronouns me, te, le, nos, os & les to say what gifts people receive. 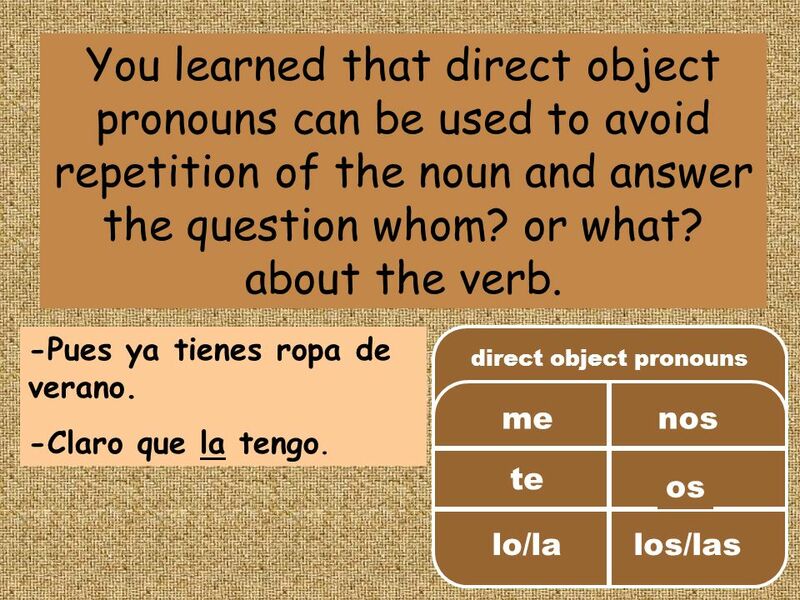 3 You learned that direct object pronouns can be used to avoid repetition of the noun and answer the question whom? or what? about the verb. 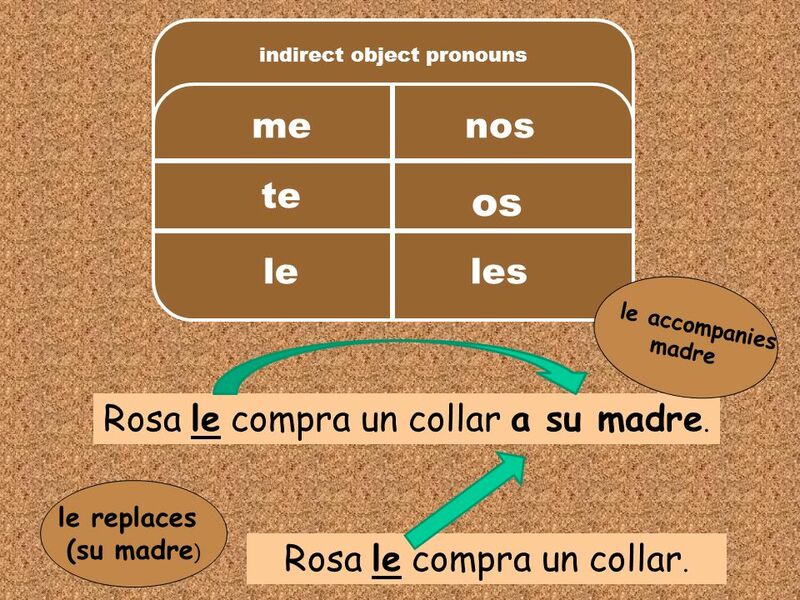 os direct object pronouns te lo/lalos/las nosme -Pues ya tienes ropa de verano. -Claro que la tengo. 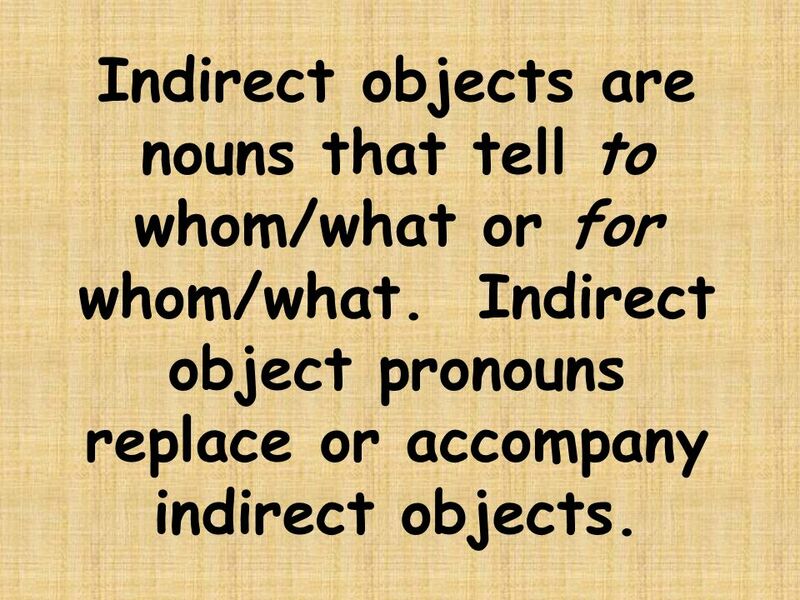 4 Indirect objects are nouns that tell to whom/what or for whom/what. 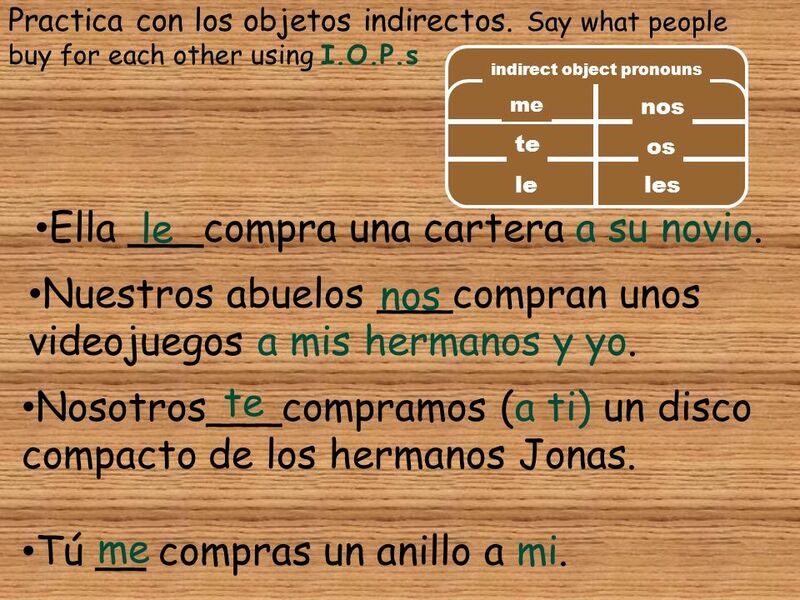 Indirect object pronouns replace or accompany indirect objects. 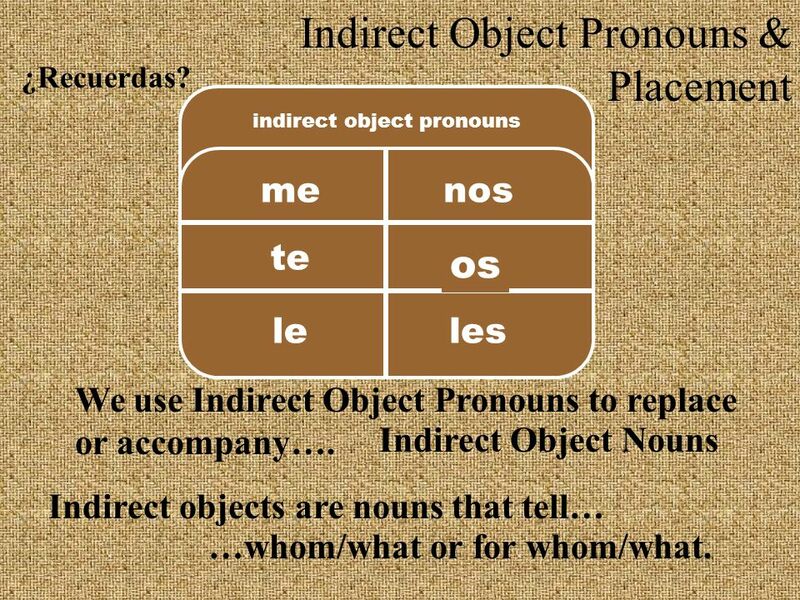 7 The pronouns le and les can refer to different indirect objects. 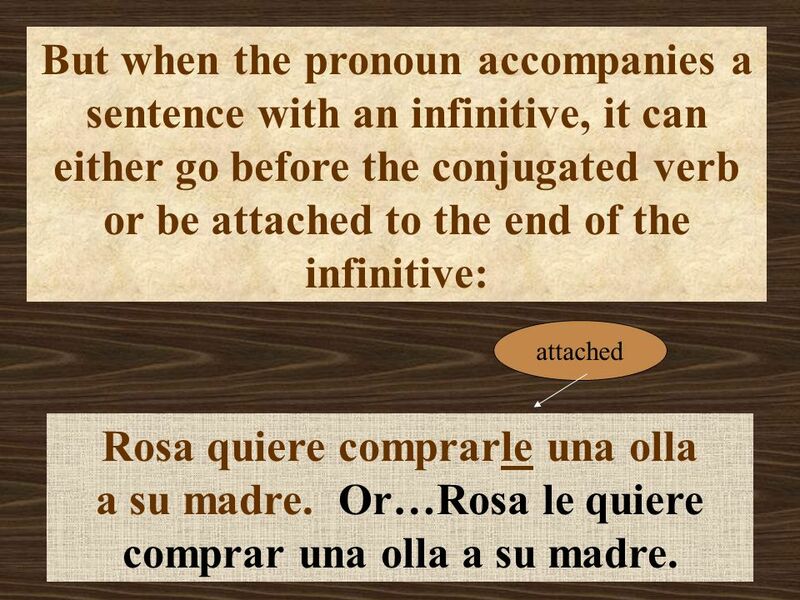 To clarify what they mean, they are often accompanied by: Rosa le compra un collar. Rosa buys a necklace for her. 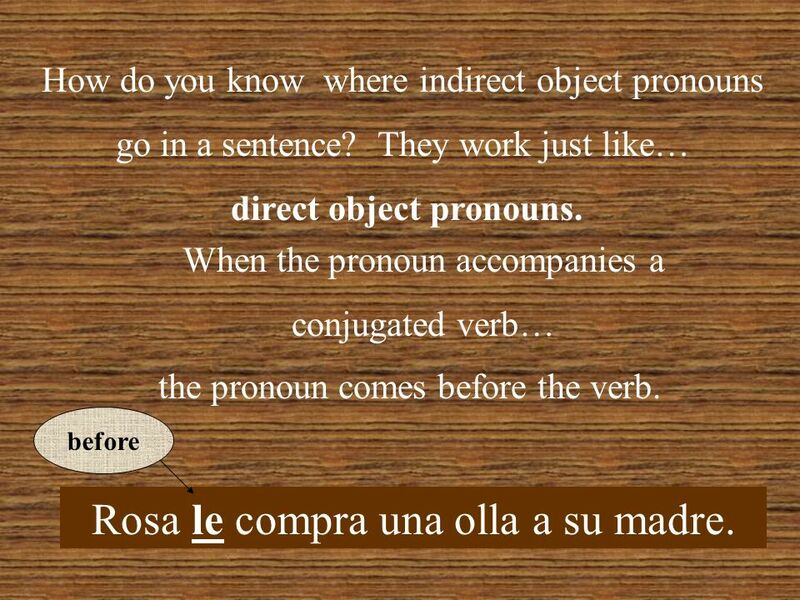 Rosa le compra un collar a su madre. 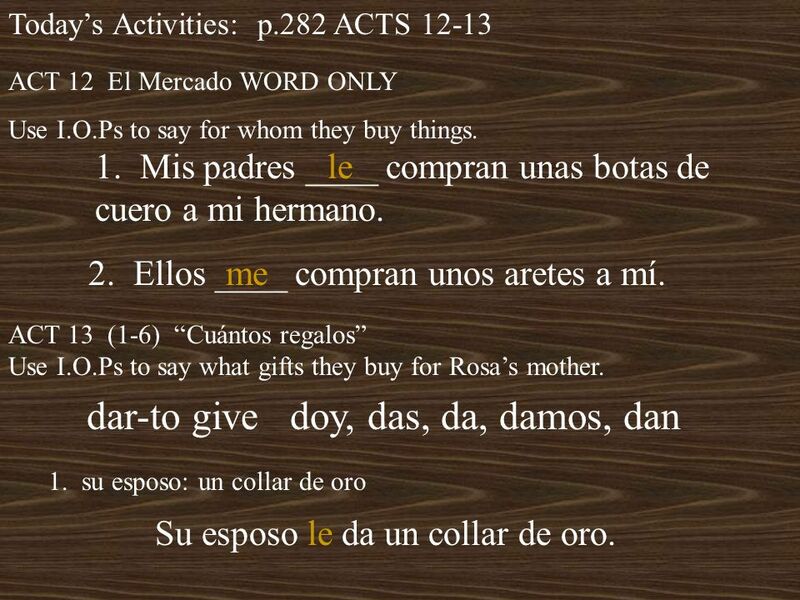 Rosa buys a necklace for her mother. 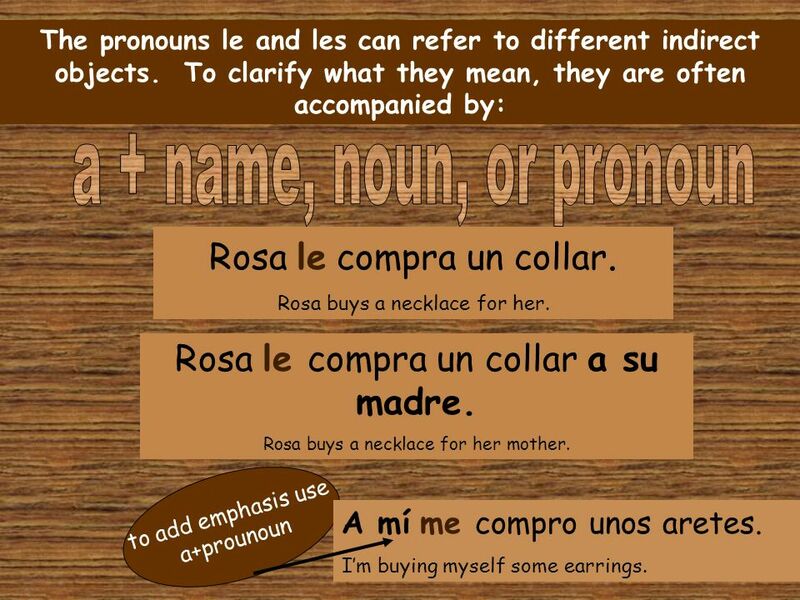 to add emphasis use a+prounoun A mí me compro unos aretes. Im buying myself some earrings. 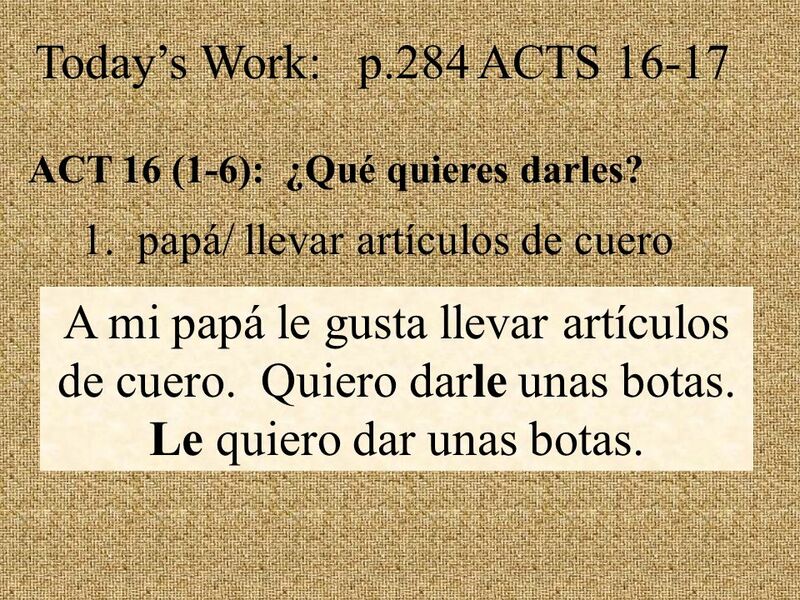 14 Todays Work: p.284 ACTS 16-17 ACT 16 (1-6): ¿Qué quieres darles? 1. papá/ llevar artículos de cuero A mi papá le gusta llevar artículos de cuero. Quiero darle unas botas. Le quiero dar unas botas. 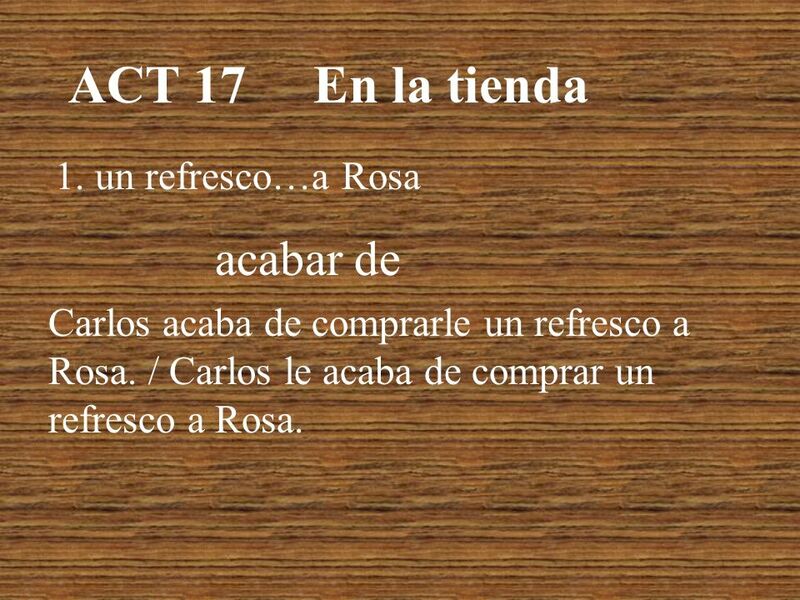 15 ACT 17 En la tienda 1.un refresco…a Rosa acabar de Carlos acaba de comprarle un refresco a Rosa. / Carlos le acaba de comprar un refresco a Rosa. 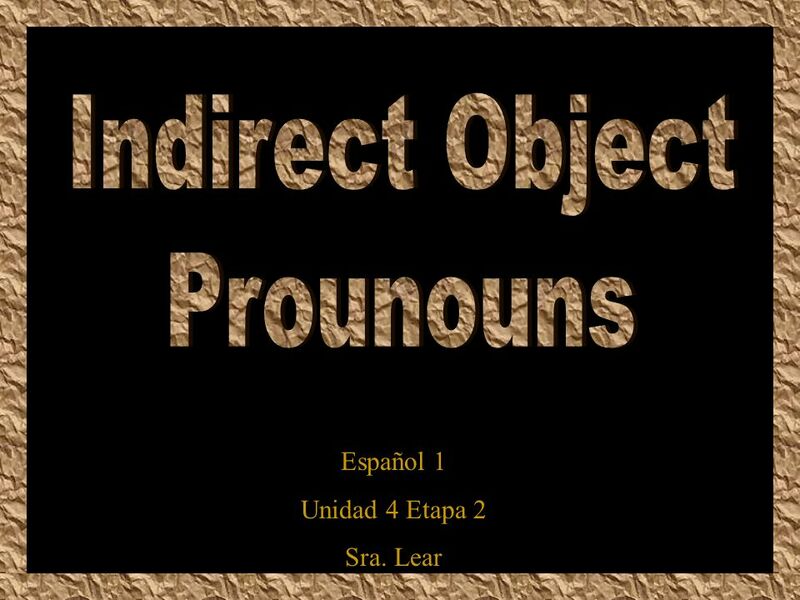 Descargar ppt "CONTENT OBJECTIVE I will be able to replace INDIRECT OBJECT NOUNS with INDIRECT OBJECT PRONOUNS. 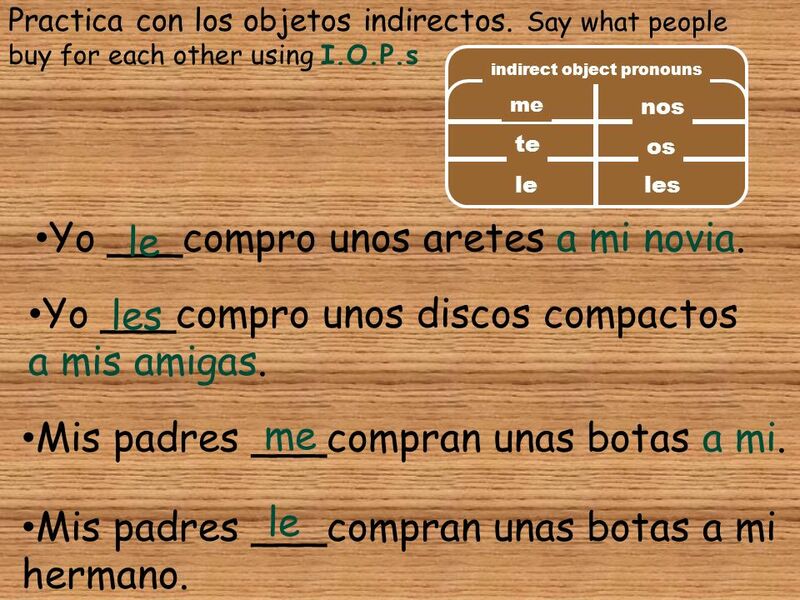 LANGUAGE OBJECTIVE I will be able to use the Indirect."